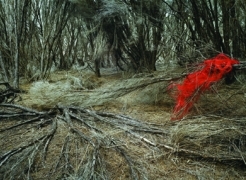 Rosemary Laing is an Australian artist known for her photo-based work that is cinematic in vision and created with real-time performance and physical installation as opposed to digital manipulation. In culturally and historically resonant locations across Australia, Laing meticulously stages interventions. 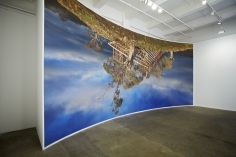 Her work is informed by post-colonial perspectives on the occupation and ownership of (Australian) land and speculates upon how the past intersects with the present situation. Laing frequently works in series, creating thematic bodies of work that are large in scale and scope and accumulatively form an ongoing narrative of events that have impacted cultural consciousness. and Istanbul Biennial, Turkey (1995). Solo exhibitions of Laing’s work have been held at numerous museums including the Museum of Contemporary Art Australia; Kunsthallen Brandts Klædefabrik, Denmark; Domus Artium 2002, Spain; Frist Center for the Visual Arts, Tennessee; and National Museum of Art Osaka, Japan. Her work can be found in many public collections worldwide including the National Gallery of Australia; Museum of Contemporary Art Australia; Queensland Art Gallery, Austrailia; Museo Nacional Centro de Arte Reina Sofía, Spain; North Carolina Museum of Art; and Modern Art Museum of Fort Worth, Texas; Art Institute of Chicago, Illinois. Born in 1959 in Brisbane, Australia, Laing currently lives and works in Sydney, Australia.